Nous avons tout apprécié dans cet hotel : propreté accueil chaleureux confort dans les chambres !!!!! 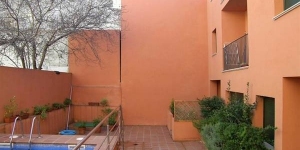 Ce charmant hôtel familial se trouve dans le centre de Begur. Cet hôtel de caractère et son restaurant romantique sont installés dans un palais colonial du XIXe siècle. Décorées de manière individuelle, les chambres et salles de bains sont charmantes et donnent sur l'extérieur. Promenez-vous dans les intérieurs de l'hôtel Aiguaclara et découvrez des éléments rappelant son glorieux passé. L'escalier dispose de belles rampes en fer forgé et son sol est orné d'un magnifique carrelage. Des caractéristiques d'origine contrastent avec le mobilier contemporain et des détails de décoration moderne. L'hôtel se situe à proximité des meilleurs parcours de golf et plages de la Costa Brava. Profitez au maximum de l'ensoleillement dont cette région bénéficie la plupart de l'année. Après vos visites, rentrez à l'hôtel pour un délicieux repas dans son restaurant plein de caractère. Me ha gustado mucho el desayuno. La musica por la noche. La tranquilidad. 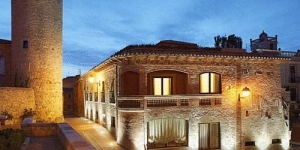 Es un hotel con encanto donde estás a gusto y te permite no tener que salir gracias a su restaurante y otras opciones disponibles como el vídeo en la habitación, películas, libros, erc. Es un trato personalizado. Todo ha sido correcto, el desayuno es a las 9 y quizás se podría adelantar a las 8. Personal majísimo y muy atento. Casa con mucho encanto. Me ha encantado la decoracion, realmente diferente y muy acojedora. El personal muy agradable. The location in the centre of town. The parking although expensive was good. The room was spacious and clean. Asked for a quiet room with a view. Got neither. Room was on ground floor off entrance hall, so noisy. The dinning room had inadequate heating so eating breakfast or an evening meal was cold and unpleasant. The decor was shabby chic. Johan and Clara and their staff looked after us very well. Informed us on what to do and see in the area and where to eat. All was very good. Un lugar con toque, cálido, de gente amable y cercana. Preciosa casa decorada con gusto exquisito, muy acogedora. Comida extraordinaria. En un enclave paradisíaco. Un diez. El trato, la decoración, es un lugar muy especial. El precio me parecio un poco alto, aunque estoy muy satisfecha con mi estadía en general. Gezellig en goed restaurant (vrijdag dj oude jazzplaatjes). Zeer vriendelijk en behulpzaam personeel. Ruime kamer. Perfect ontbijt (ruime keuze zoet/hartig, goede koffie). Ontbijt pas na 9:00 uur mogelijk. Slechte wifi-ontvangst in de kamer(s). What a great place. Incredible food, great location and amazing owners. The aigua clara has a uniquely creative design and feel, which makes if feel like a beautiful home away from home. The owners have thought of every detail, even providing beach towels and an 'honesty bar' stacked with anything you might need.They go out of their way to make you feel welcome and taken care of. I have no criticism of the hotel, but I would not recommend Begur as an ideal holiday destination for solo travellers. I did not meet a single other solo traveller whilst I was there, its mainly families with small children, and couples, and I was refused a table for one in several of the restaurants. This has never happened to me before, and I have travelled extensively. Friendliness of owners, relaxed feel, quirky/vintage style of hotel, chill out space. Paying for parking, bathroom a bit small. Sehr nette Besitzer, man fühlt sich sofort willkommen. Das hotel hat einen eigenen Charme und ist in sienem Ambiente ganz anders als die üblichen Hotels. Everything, we just loved everything about this Hotel. The owners and their staff are truly beautiful people! The church bells ringing every 15 minutes! Ein sehr individuelles Hotel in einem sehr schönem Stadthaus, mit sehr freundlichen Personal. Fast zu schade für eine Nacht! Sehr gutes Frühstück. Zentrale Lage - gerne wieder. Decor. Owner treat you like guests in their own home. Facilities are lovely. This is not a hotel for those who want 24 hr concierge, mini bars and haute cuisine restaurant. That was perfect for us, but is is more like a grown up guest house than a sophisticated hotel. Watch out for a child in the room above. One that plays with wheeled toys on the terracotta tiled floor or bounces a ball. The noise is awful, but the owner immediately spoke with the parents and the noise reduced. Superb hotel, very quirky but beautifully furnished - utterly characterful. Great staff, good food, excellent value! A real one off. No hot water on 2 mornings, noise from other guests in the mornings closing the original double doors that every room has! El servicio, la amabilidad y familiaridad. La decoración. Estás como en casa. Un hotel muy acogedor en el que nos hemos sentido muy a gusto. El trato del personal exquisito, la habitación muy confortable y todo puesto con mucho detalle. Nosotros viajábamos con un bebé y todo fueron facilidades para que estuviéramos cómodos. Totalmente recomendable. Vind de accomodatie wel wat hoog geprijsd. El trato I la ubicación han sido excelentes. No todas las habitaciones son buenas, a nosotros nos toco la primera noche una habitación con dos detalles importantes, estaba a ran de calle I al lado de la puerta de entrada, después muy amablemente nos cambiaron de habitación.